With 6.2 seconds left in the game, No. 22 Auburn’s Jared Harper missed an important free throw that would have killed any chance at a Florida comeback. Instead, it left enough time for the Gators to get something up to try and tie this game up, down just 65-62. Harper’s miss was recovered by Florida’s Keyontae Johnson who got the ball to Andrew Nembhard around half court. The Tigers attempted to foul Nembhard with the idea being he’d get sent to the line and, at worst, score just two points. 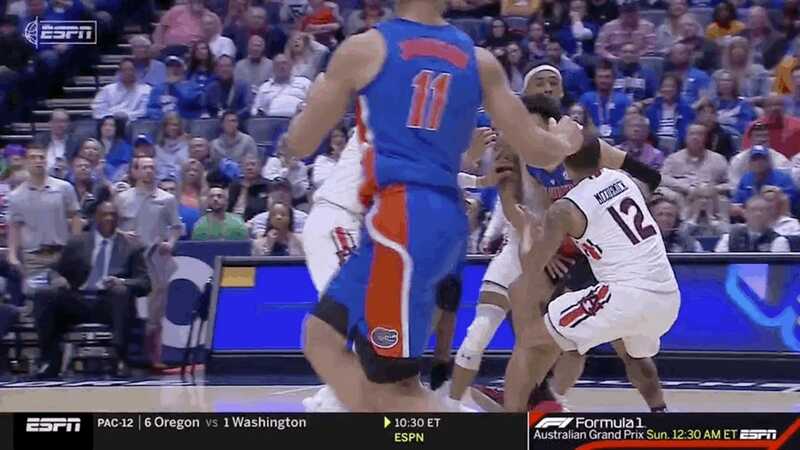 But the Gators guard saw the foul coming and started a shooting motion. Clear contact was made on Nembhard and for a brief second, it looked like he would be going to the line with a chance at tying the game. Instead, the refs swallowed their whistles and let a pretty blatant call go. If that clip didn’t convince you that Florida was wronged for some reason, here are a few more angles showing Nembhard’s arm getting smacked on his desperation heave. At the very least it’s hard to understand why nothing was called in this situation. Bruce Pearl was popping veins out of his damn neck trying to tell his players to wrap up whoever had the ball, and they obliged. Even if the refs didn’t hear Pear’s screams, they should have at least had the in-game awareness to recognize this could be an ideal time to foul and prepare accordingly. Instead, they seemed to watch the play unfold like the rest of us, jaws agape at someone trying to take an incredibly deep buzzer-beating three—you can see the official that should have had the best view of the play meekly signal that a three was shot a couple seconds after his coworker did. Terrible officiating in important games is a sign that March has truly begun.